Leather wrap bracelet with gold studs. Bracelet wraps three times and is 19" long. This is my favorite item out of the bunch! If I could, I would buy one in EACH color!! They are so awesome and you can wear them everyday, basically with any attire. At first, the leather is a little on the tight side when wrapped around 3 times. However, remember that leather stretches. The more I wear and break-in this bracelet, the more the leather relaxes and it fits perfect! I absolutely LOVE the combination of black and gold. I wear this with the two necklaces I review below. It's such a simple wrap, but it makes a statement! Layered chain necklace with assorted styles of chains throughout. 41" long. 18k gold plated. I really really really like simple chain necklaces. This is something I recently got into after seeing the hype over Lisa Taubes chain necklaces on youtube. If you are a fan of TheCurrentCustom and Michele1218, then you know what I am talking about. First off, gold is my thing! I LOVE gold. I find I wear it more than silver for some reason. To me, gold dresses up any outfit, it's timeless yet modern. This necklace extends into three chains that hang nicely. THIS PIECE IS PERFECT FOR LAYERING!!! It's mainly why I wanted this necklace, because I can layer it with other necklaces without looking like it's too much. This is my second favorite from the bunch. Love this!! 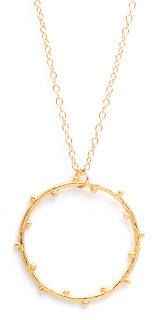 Chain circle necklace with textured circle charm in the center. Charm is 1 1/4" in diameter. Necklace is 25" long. 18k gold plated. 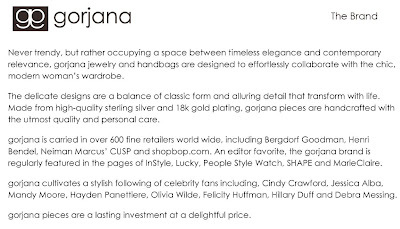 Gorjana has many different circle pendants, you must go check them out. I like this one because it isn't a plain-ol'-circle. It has gold bumps/dots all over it, giving it a nautical affect- like a ships steering device. Besides from the nautical feel I get, I also see a little bit of a seasonal ambiance. The Willow necklace reminds me of Fall-time leaves attached to a thin wreath. Okay, I probably sound crazy trying to explain this circle. But that is my point it is a simple circle, but unique in the design. So it isn't a boring piece. It layers beautifully with the Savannah chain necklace. I absolutely prefer wearing these together rather than separate. So what do you guys think of Gorjana??? 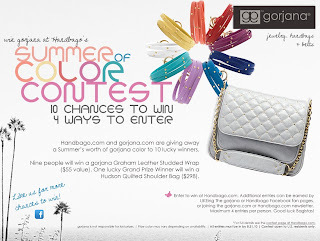 a Summer’s worth of gorjana color to 10 lucky winners. Hudson Quilted Shoulder Bag ($298). 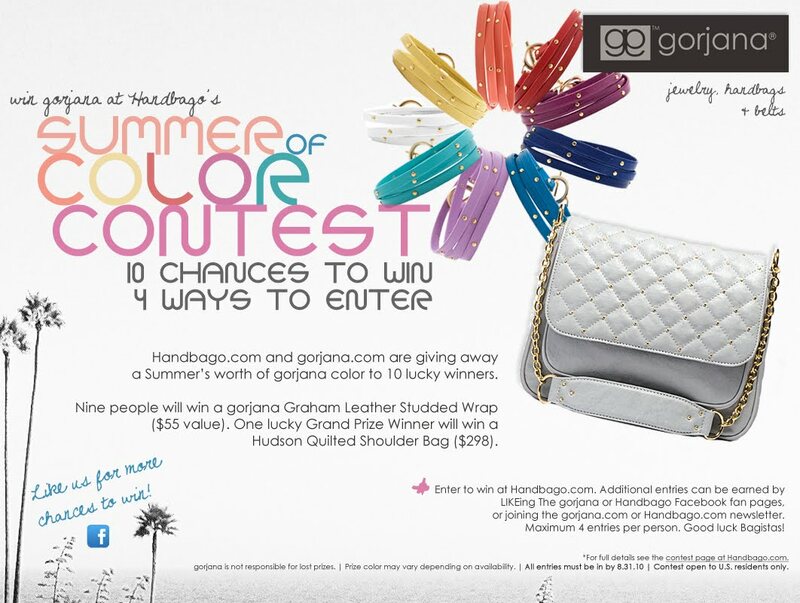 or joining the gorjana.com or Handbago.com newsletter. Maximum 4 entries per person. Good luck Bagistas! Gorjana's company is from UK. All the accessories is of Gorjana is looking fabulous. Rings is also looking very pretty.